Take the spork. Simple, practical, sleek, disposable. Perfect in design. Now make it … indestructible. The immortal spork. For $8.99, one can own the ultimate in eating utensils. I present, the titanium spork. And new for 2007, it comes in three colors: blue, lavender, and gold. Finally, we have found the quintessential weapon of the gadget geek. Reminisce about those days eating lunch in the cafeteria and not having to change utensils as you transitioned from soup to salad. And feel like a man while you attack your low-cal yogurt with Splenda. We have titanium mountain bike frames, eyeglasses, electronics, and airplane parts. 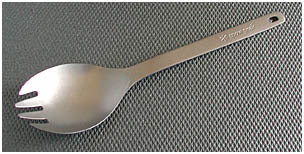 As a natural extension of the materials science industry, the creation of the titanium spork signifies the pinnacle of metallurgy. Invented initially for the camper trying to lighten their load, the titanium spork is a powerful, lightweight (0.6 oz), corrosion resistant tool to replace all tools. Throw away your silverware, one-up your neighbors, and impress your guests. 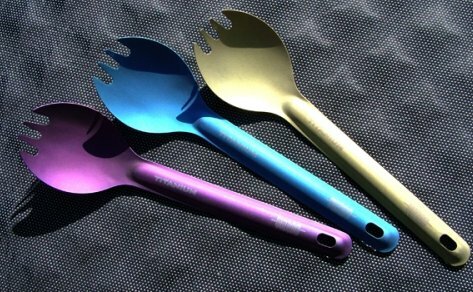 The original titanium spork is available from Think Geek and you can get the colored ones from BackPackingLight.